Just like that, in a matter of seconds, the competition season is underway. After seven months of preparing it was time to put on a bib again and see what I was capable of on the race track. If you looked at ski racing in the same light as academics, you would expect after seven months of studying you should be extremely well prepared, and confident in how you can perform. Unfortunately, unlike academics, getting sick shortly before the big day can have surprisingly dismal impacts on the result, especially when you through antibiotics in the mix. First heat of the first race of the year!! 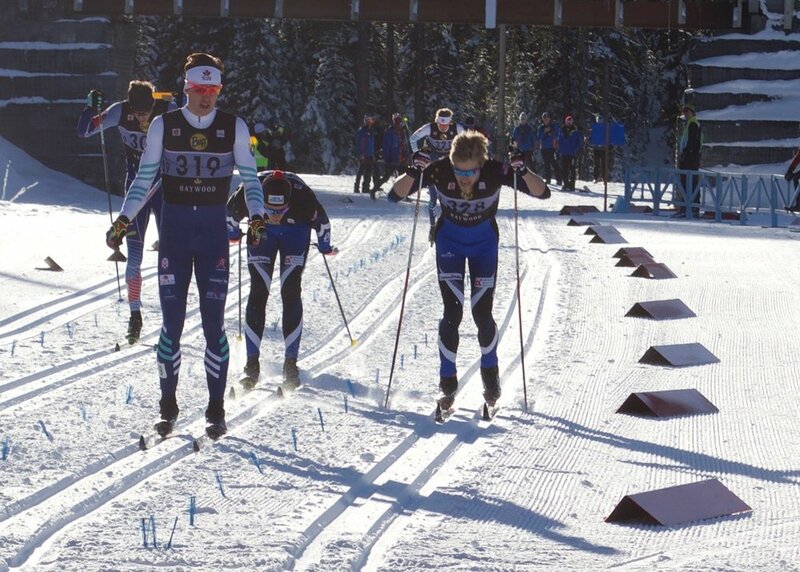 That being said, I was still super excited to be at the first set of races of the year at Sovereign Nordic located on beautiful Silver Star mountain. As far as Nordic skiing destinations go, there are not many places that top silver star, so go results or not its easy to enjoy time spent up there. Once again this year the Sovereign NorAm was also a Supertour, the American equivalent, and to raise the stakes, even more, the race weekend was a part of USA Olympic trials. First up was the classic sprint, after a mediocre qualifier I was able to ski a solid quarter-final and win the B-final finishing 7th on the day and second Canadian. The American domestic field is always extremely deep, and in the early season before Christmas, they always seem to be firing better than us Canucks, so it was nice to see a fellow Canadian and NTDC Tbay athlete take the win! Just five days after the racing finished at Sovereign it began again in Rossland B.C. I came to Rossland for the first time as a Junior four years ago and have loved coming back every chance I get. The quaint mountain town tucked away in towering forests with amazing ski trails is always super fun to come back to. As well, Blackjack Nordic usually holds a mini-tour race weekend in which the times from the first two days of racing are tallied up and the final day is started according to accumulated results. I had a rough go the first day putting me behind to chase but after a bounce back in the skate sprint the second day I started in sixth overall on the final day, the 15km skate pursuit. Starting in 6th I was just ahead of where things started to bunch up and people start working together to chase down the leaders so I started strong then dialed it back until I was engulfed by the pack. Pack skiing is one of my favorite parts of ski racing, especially in a pursuit when everyone has a common goal in mind to try and reel in the guys ahead of the pack. I started to feel like I found a race gear by the third lap of the race and started to push the pace, I ended up finishing 4th overall in the minitour and fourth on the day. The mini-tour wrapped up racing for 2017 it was time to head home for Christmas and prepare for things to come in the new year! The first snowfall has arrived and racing has begun, fall is beginning to show signs of transitioning into winter. When the calendar turned over to November it marked the first race of the season in Canada. As crazy as it may seem, I opted to forgo the event to stay home in Thunder Bay and continue training for the entirety of the fall in hopes of improving my fitness for the winter race season. Intensity at Lappe this fall! For a given race day, like the one that just passed at the beginning of the month, it is a competition of who is the best ski racer, who deploys the best tactics, pushes themselves the hardest, and has the fastest skis. From May to October during the "training season," you are still competing against everyone you line up with on a race day, except instead of being a competition of who is the best ski racer; the training season is a competition of who is the best self-improver. Skiing can be a difficult sport to gauge self-improvement; times for events are extremely variable based on conditions and equipment. Running in comparison is far more accountable, from one year to the next on the same 10km course the variables that affect your time will, for the most part, be under your control. Sure there might be a stronger headwind or the pavement might be wet but in comparison to a 10km ski race where times can change by over a minute based on the weather, self-improvement can be quite difficult to judge. As a first-year senior, I am getting to the point where increments of improvement are getting smaller, and harder to find. As a younger athlete, the margin of improvement was substantial and far easier to notice from one race season to the next, or even a single training camp. One of my biggest goals for the year is to continue improving. I know right, that’s extremely vague and hard to measure, but it is more so the idea of it which I’m trying to achieve. So this fall the plan was to get fit, not fast. Last year I improved my speed quite substantially, however, my fitness became inconsistent and was what I saw as my weakness in many races. In September I did a three-week training camp in Schladming Austria with NTDC, It was a volume camp focused on spending time skiing on the Dachstein glacier. The largest benefit of travel overseas to Austria and the Dachstein was the accessibility of snow, a five-minute gondola ride from the parking lot. this meant we could be skiing up high in the morning, and roller ski down low in the afternoon. I spent the first 8 nights of the camp sleeping high in a separate accommodation from the rest of the team, doing what would get the most out of each day for me. It was great for the days we skied, I would wake up, walk across the parking lot, and be in the gondola line up. I then moved down to the bottom of the valley for the second half of the camp to let the body recover, and put a bit more focus on the intensity workouts of the camp. In terms of maximizing improvement, the Dachstein glacier and valley is one of the best training regions in the world to do so. Having access to high-quality skiing on the glacier up high (2600m) and a world-class roller ski track over a thousand meters lower within a 15-minute commute is hard to come by, and incredible for fall training. National teams from many other nations agree the area is a hotbed of cross-country skiers in the fall. Each day on the glacier there was roughly 200 skiers on the glacier and during afternoon roller skis I encountered more athletes in one hour than I would the entire summer in Canada. my last night at solo camp up high. unbelievable sunset! The three-week camp was very productive, hopefully, I will reap the rewards this winter and see an increase in the consistency and level of my fitness. Next time I travel it will be for the real deal, racing begins, I will travel west at the end of November. Hears to hoping the improvements I have made over the summer and fall will pay off. As I mentioned earlier, equipment plays a massive role in this sport, it can be the difference between a good and great race, so thank you to my equipment sponsors Rossignol and Leki for setting me up for success! As a winter sport athlete, getting on snow is often a big focus for skiers in the summer months. The past couple years i have avoided summer skiing to reduce aggravating my damaged shins, I did not ski for 6 months last year from May through to October. New and improved me doesn't have to worry about stressing my shins as a top priority anymore, and so this year getting on snow was a goal, so far I have accomplished it, June and July will be the only months of the year I'm not on snow. At the beginning of August, I started driving west, in a car that wasn't mine, destined for Canmore. For most of August, I would be training from Canmore getting a volume block in with some altitude and snow exposure. The plan was based around spending a few nights up high at an alpine hut, and later in the camp up at the Haig glacier. Before I got there I had 2,100km of highway to cover with the air condition lacking, cruise control-less car I decided to drive out . Some friends recently moved to Kelowna and only took one of their two vehicles, it saved them some time and me some money to have me drive it out to Canmore so being mutually beneficial I couldn't resist. On the drive out, and for the duration of my time in Canmore, I stayed with friends i have met in the ski community. It's amazing how generous and supportive people can be, opening their homes to an odd individual like me to stay with their family for weeks at a time, but i certainly appreciate it! After settling into Canmore following the the cross country drive, I headed into the up to the bow hut and into the alpine to kick off my time training with the Academy. Mike Somppi, Dominique Moncion-Groulx, Jack Carlyle, and I spent two nights at the bow hut up above 2300 metres, around our time sleeping and eating at altitude, we roller skied and ran in the Lake Louis area supported by the AWCA staff. The focus of our time at the bow hut was volume, with the 8km run-out to start training proper, and the 8km run back in to finish the day off, we were logging big training days. The run out in the morning with full bellies just after breakfast while the sun rose was certainly more enjoyable than the uphill version in the hot afternoon sun at the end of the day. complaining aside, spending a couple nights up at the hut was great to get the body adjusted to sleeping and training at altitude to make the transition to the Haig more efficient and make the most of every day on snow. I generally feel the affects of altitude, the first night in particular, and the bow hut was no exception. I woke up around in the night with a bad headache and feeling nauseous so i immediately downed another 1000ml of water to make sure i was not just dehydrated but it definitely was the altitude, I moped around for some time knowing i had forgotten the ibuprofen I planned to bring up. I nearly made a cup of coffee as i had heard the caffeine can help and was that desperate, but luckily just as i started to I stumbled over Dominque's emergency Advil which made my night and saved the next day. After the first night I was fine and felt much better training, as wimpy as it sounds getting above 2300m hits me hard, altitude in general for that matter, it is something i'm trying to work on. After loggings some big days up at the bow hut I was back in Canmore for a week. I was quite lucky not to have any bad smoke days while training there, one evening it rolled in quite thick but for the most part it did not impact training. That being said it was a volume block and so the smoke did not impact training the way it would if it was an intensity camp. I had not been up to the Haig for 5 years, last time I was there it was my first training camp with NTDC and really my first training camp. Since then I have become a much better athlete, mostly in terms of habits and knowledge but also, to some extent, my fitness has improved quite substantially. This time around i knew what to expect and how to get the most out of my time up at the base camp and on the glacier. Classic skiing is far more manageable in soft snow, it is not necessary to sacrifice increasing your heart rate or throwing technique out the door to keep the quality high which can be the case while skating. At 2700m it can be tricky to keep yourself in an optimal training zone with good technique with perfect conditions, so changing technique with the changing snow is a good way to adapt. The hike back down might be a highlight of the day for many skiers. The sharp elevation jump from 2300m up to 2700m definitely make it lopsided as to which one is easier but there is an added incentive to the decent, boot-skiing. On the hike there are a few patches of snow that survive for most of the summer and allow for the dreary skier to opt out of descending the steep scree slopes and choose to hop, skip and slide down. Boot-skiing is faster, easier and of course far more fun! The last day up at the Haig was a big one with a full morning of skiing followed by a long, extended run out to civilization at the parking lot. Over the five days i spent at the Haig I trained more than I do most big seven day weeks and helped reach the milestone of 100 hours in a month. My time our west was a tone of fun and very productive, thanks to everyone who was a part of it. For the past few years, all the training centers under the Cross country Canada body have come together for an annual training camp. Following the past two happening in Canmore and Mont Tremblant, this year was Thunder Bay's turn to play host. The focus of this years camp was intensity, being at sea level and having the opportunity for us to train with a big group from across Canada it made sense to focus on hard efforts so we crammed in five intensities in eight days! 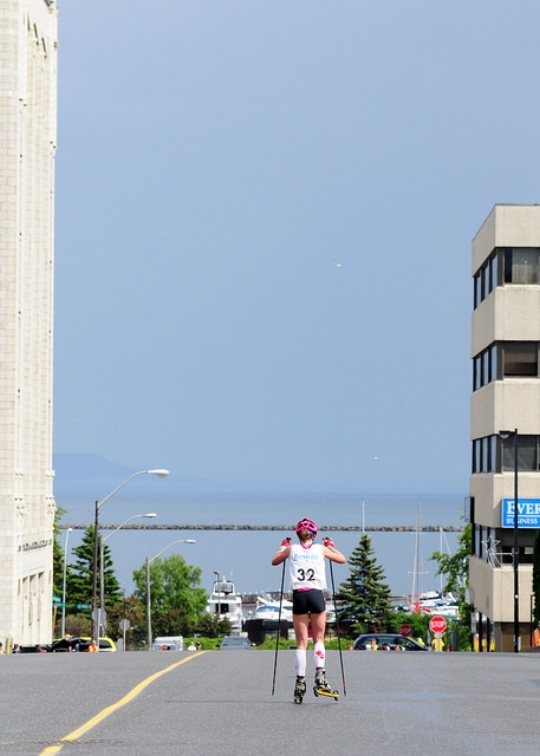 The first intensity of the camp was the headliner of the week, the roller ski race that took place in downtown Tbay. Any chance us nordies get to race on skis is exciting and having the extra incentive of cash prizes, spectators, and on Canada Day made it extra special. It was the first real race i have ever done on roller skis and being at home on the streets where i grew made it a pretty cool experience. Hoping not to disappoint in front of the crowd i definitely put a bit more preparation into getting ready for this one compared to most workouts, the added incentive of cash on the line may have played a part as well. whether it was the prizes or the process that caused me to, it was awesome to feel a little nervous heading to a workout at the beginning july. I had a ton of fun competing in the event and was quite happy to end the day feeling like it was a successful effort and with a little more cash in my pocket. I had been putting in some big hours both at work and training for most of May and June, I was not sure where the body was at for top end fitness. I knew i was getting good base fitness with the amount of volume training i was doing, but that was the focus of june, not speed, and with the added exertion of working for 8 hours 3-4 days a week i was happy to find i was not suffering the consequences from limiting my rest and recovery time. The final intensity workout of the camp was also a race event, however this time it was done on teams. The coaching staff from all three training centres divided all the athletes up into what they thought were even teams of three for Matterhorn Madness, a 1600m climb lapping the steepest ski run at Mount Baldy, a local downhill ski area here in Thunder Bay. each lap accents roughly 150m so as teams of three we each got to hammer up what felt like the steepest hill i've ever climbed 4 times. the Camp was wrapped up with a long easy run on the sleeping giant, a classic workout for any training camp in Thunder Bay. The lengthy trail system with multiple views back across the lake to the city makes for a great long workout and shows off some of the most picturesque training Tbay has to offer. During the run i went over on my ankle, which unfortunately is becoming a reoccurring theme while trail running. I had never dealt with any serious ankle sprains while running until last fall, since the surgery i had last summer my shins have been pain free which has been incredible, but the one side effect seems to be weak ankles. luckily this was not a serious sprain and i was able to finish off the the run and wrap the camp up on a good note. I wrote an article for Fasterskier.com on the roller ski race during the camp. for a more detailed summary of the day's events check out the link below. The 2017/18 training season is now well underway and I kicked things off with a new twist this year. I flew out west to get on snow at Sovereign Nordic, just up from Vernon BC, for an early season altitude volume block to regain some base fitness over during a needed recovery month of April. Sovereign Nordic re-open for their Spring Fling camp from May 4-7th giving athletes like myself one last chance get on groomed trails before packing away the for the summer. for temperatures above 20C, blue skies, and being early May the skiing was phenomenal and there was no shortage of snow. there also was a race in conjunction with the camp which i used as my first intensity of the year. After four days on snow logging some big training hours to start the year, Annika and I navigated the flooding terrain of interior BC back to Vancouver with a short visit in Lillooet to see my mom. the four days of big volume on snow were definitely the focus of the trip but it also served as a good excuse to visit my mom and spend some time in Vancouver with Annika and her family. My Dad gives me a hard time about how he needs to check the NTDC twitter feed or a teammates website to know what i'm up to when away for a training camp or race trip. hopefully, this page helps keep tabs on what i'm doing while on the road for him and a few others.